My name is Jean-Paul Suijs, PA9X. I was born in 1972 in the city of ‘s-Hertogenbosch, capital city of the province of Noord Brabant, about 80 km east of my current QTH. I currently live in the town of Vlaardingen (loc: JO21EV), between port city Rotterdam and the North Sea coast. Vlaardingen is known for having harboured the largest herring fishing fleet in the world. I have been busy with radio since I was only just a two year old little fellow. At that time, my father owned a nice Philips AM/FM and shortwave receiver. A good old analogue one, with nice big futuristic aluminum tuning knobs. I discovered when turning this tuning knob, something special happened. In 1980 CB became legal in The Netherlands. My dad bought us, me and my two elder brothers, a permit and a 22 channel 0.5 W FM radio with a good looking tall vertical antenna on the roof. The 8 year old boy was intrigued by the fact that making radio contact was so easy. But even more intrigued by those foreign voices, which my dad explained as CB’ing Italian and Spanish truckers from the nearby highway (which it wasn’t, it was real DX!). But unfortunately, local CB became more of a swearing competition. A few years later both the radio and antenna were sold. In 1988 one of our neighbors was cleaning up the attic and found two CB base radios that he gave to me and my eldest brother. We bought a DV27 mobile whip, and mounted it next to the window. Unfortunately both radios had blown up end stages, but we could still listen local QSO’s. So after a few weeks, we wanted more! My eldest brother and I decided to go to the annual radio flee market. We both bought a used 40 channel 4 W FM CB radio. He put his one in his car, and I hooked mine up to a mobile whip near the window. Unhappy with the range, the mobile whip was soon replaced with a GPA27 base antenna on the roof. 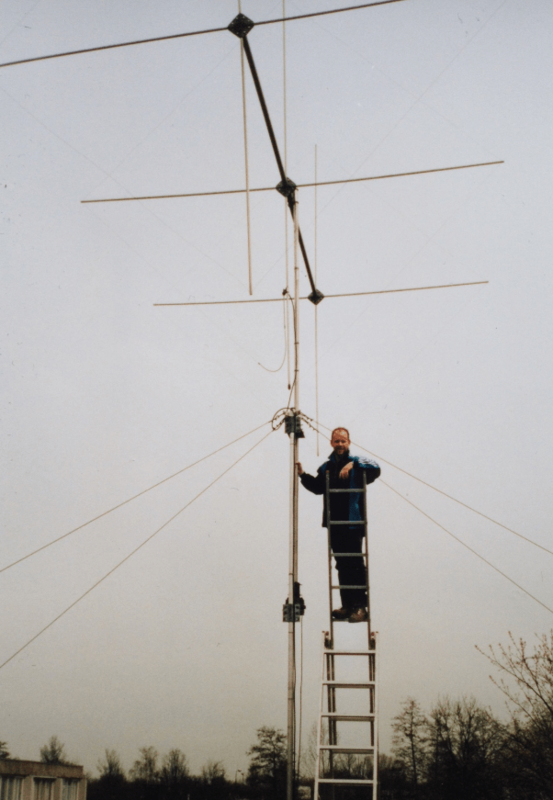 I discovered DX’ing, when I made my first QSO with a Croatian station on a summer evening, and that was my start for more. Soon a new modern CB radio, a communications receiver and a directional antenna were added to my station. My wife and I bought an apartment in 2000, which was not suitable to continue my hobby. But when we moved to a bigger house in 2004, and AM plus SSB were legalized, I bought a new radio with these modes, put up a nice 5/8 wave antenna and started DX’ing again. The limitations of 27 MHz (low power and one band) made me study for the Novice class amateur radio registration. I passed the exam in 2008, became a registered radio amateur and discovered a new world on HF with my callsign PD1JP. HF propagation was always my biggest interest. I started to build my own antennas, preferable from scrap and ‘unusual’ materials. 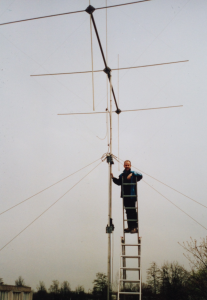 The Novice class registration limited my operations to 25 W PEP on 70 cm, 2 m, 10 m, a part of the 20 m and the 40 m band. After 4 years on these bands, it was time to move up to the Full class registration which gives access to all bands, up to 400 W PEP. After 5 months of study with a good teacher, PA3S OM Steef, I passed the exam in March 2012, and registered my current callsign PA9X. I love DX. My favorite band is 10 m, however I am also active on other HF bands. In the summer 6 m attracts most of my attention. In years of less solar activity, I move to 60 m and 40 m band. My main mode is SSB. But when 10 m is open, I always like to move up and do AM or FM. I am also active with PSK and RTTY. When I am not listening, I am doing WSPR on all HF bands and 6 m.
Propagation intrigues me. I have learned a lot about it and am able to predict propagation for 10 m, which gives me an advantage when DX’ ing. I spent a lot of time analyzing WSPR data, Rx data from NCDXF beacon monitoring stations and finding correlations with space weather. Many amateurs build there own electronics. I am more of a mechanical guy (I have a college degree in mechanical engineering). Building antennas is what I like. Preferably from scrap metal, some wood, used plastics and other materials that you would usually put in the garbage collector. I met my wife (my best friend) in 1998, and we got married in 2007. We have a son born in 2002, he is a technical genius and a very fanatic flight simulator pilot (he lands a Boeing 777 gliding without engines). Our daughter was born in 2005. She is a caring and creative genius who makes inspiring drawings and paintings and writes her own comics. I studied to become a mechanical engineer. I used to work as an engineer, got into sales, then got into marketing and now in public relations and communications. My profession is Manager Content at Imbema Group, an international wholesale company in superb quality industrial supplies. I am responsible for all the content on our 22 websites. From publications by our specialists to products and from strategy to SEO tactics. I am an expert in online communication strategies, a ‘Content Supercharger’. VERON is the Association for Experimental Radio Research in The Netherlands. I am member of the VERON Central Board (HQ). Also chairman of the VERON Public Relations Commission, supervising the VERON ICT Team and chief editor for the VERON main website and social media channels.